Home → Soft2Secure → What is a proxy server? People who use the services of Internet providers for more than a year already probably know what a proxy server is. This article is recommended, most likely, for beginners, although it is possible that some experienced web users will find interesting information here too. 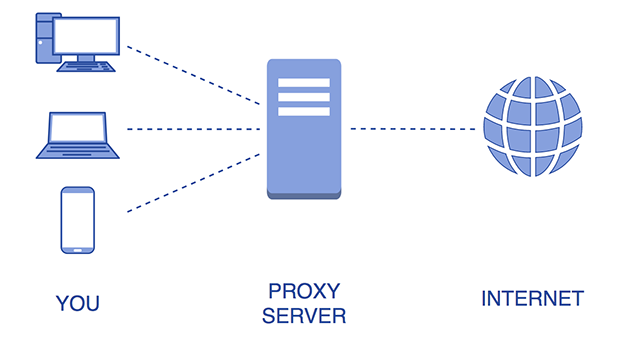 So, what is a proxy server and why we need them? A proxy server is an intermediate (from the English proxy – “representative”, “substitute”) server between your computer and the web site. That is, when using a proxy, a request from your computer will first go to the proxy server, from which, after processing, will go to the required web server. The use of a proxy allows you to speed up Internet speed and access some websites faster. This happens in case a powerful proxy server is connected to a high-speed communication channel. Accessing the Internet using a proxy server helps to increase your online anonymity and hide your IP address. If you are banned on any web service but you need to get there, then, when changing the IP address, you can go around the ban and enter, for example, the desired discussion forum. The use of a proxy server allows you to manage traffic in corporate networks, that is, you can connect some users directly, and other users through a proxy, which makes it possible to unload communication channels. There are many other ways to use proxies. Now let’s see how a proxy server allows you to speed up access to the desired website. For example, you need as quickly as possible to get from New York to Los Angeles. There is an option to go by car right now – today or take a plane tomorrow. You understand that after waiting one more day, you can quickly get to Los Angeles since the delay in departure will be compensated by a much higher aircraft speed. So, the scheme New York – Los Angeles (when traveling by car) loses the game to the scheme New York – airport – Los Angeles. The last one is a scheme of working through a proxy, where New York is the user’s computer, the airport is a proxy server, Lost Angeles is the required website. Now I will try to explain the essence of IP changes with the following example. Imagine you are a journalist and you need to get into the combat territory in country C to make an important news report. If you travel from your native country – A, you will be officially restricted from crossing the border. So, you fly to country B neighboring to country C, from where, under the guise of a tourist you enter the country C. And the scheme looks like this: country A – country B – country C. In this paragraph I am showing a substitution, during which you are from an experienced journalist turn into a lost tourist. In the same way, a proxy server changes your IP address, making the web server think that you are in a different place. It is true that most proxies keep connection logs, which allow restoring a reverse chain in each case. That is, in our example with a journalist, if country C authorities want to check it, they will be able to find out that you got a visa of country B, and that you came here from that country. All is done simply by checking your documents. You need to understand that having made some illegal actions on the Internet, interested parties will often be able to find you. It may not happen immediately, but it is doable. Doing something on the Internet you leave traces in the form of proxy server logs, the provider’s server logs, etc. Some proxies, however, do not change IP (these servers are also called transparent), but simply allow caching data, that is, speeding up access to websites due to the fact that some of the content gets uploaded to an intermediate server.